Most Linux and Open Source enthusiasts are familiar with the OpenOffice.Org office suite. OpenOffice is great, but sometimes you just need a lighter and faster alternative. Maybe you've got a netbook or an older computer and you don't need a full, integrated, office suite, but just a few of the main applications like a word processor and a spreadsheet program. 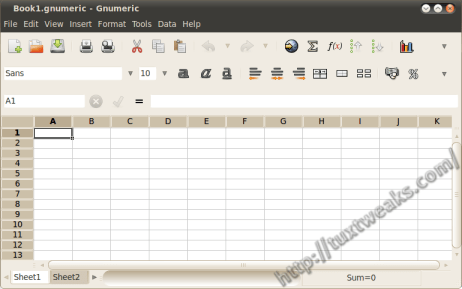 Gnumeric is one such spreadsheet program. Once it's installed, you can find it in Ubuntu's menu ender Applications?Office?Gnumeric Spreadsheet. Even though Gnumeric is light and fast, that doesn't mean it's short on features. Check out the extensive feature list, (from the Gnumeric website). Gnumeric will try to parse user entered input as a number with a format applied (so you can enter dates directly, and they will be stored as a number + a format to render it). Gnumeric has been localized to various languages, and we welcome new contributions. It handles numeric formats properly for various countries and languages. So as you can see, Gnumeric a quite a feature complete spreadsheet program that should meet almost anyone's needs. Check it out and give it a try.